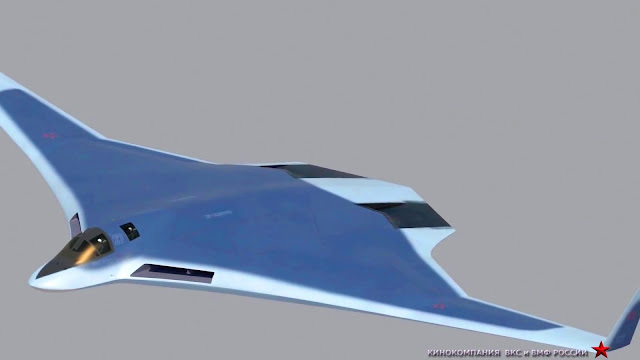 Developers of the Russian new-generation strategic bomber, known as the Advanced Long-Range Aviation Complex (PAK DA), have defended the preliminary design of the project, according to Evgeniy Fedorov, scientific director of the Russian State Research Institute of Aviation Systems. According to him, the Defense Ministry submitted very strict requirements for the new aircraft. "The military mentioned everything they could, including a strategic bomber, an operative and tactic missile-carrying bomber and even a long-range interceptor capable of launching space vehicles," Fedorov told the Russian news agency RNS. I'm guessing (limited knowledge here) that they're talking about the plane going thru what we would call a design review. If they're just getting that done then they're slow walking the project. But that isn't the big news. The big news to me is that what they're describing is essentially an arsenal plane and not a simple bomber. This had me thinking...are we seeing the evolution of the simple bomber into a multi-role airplane? A bomb bay can obviously hold missiles. If the bomber is designed to carry heavy bomb loads on pylons on the wings then you can certainly hang missiles there. The bomber isn't dead it's evolving. The next step is gonna be to use that bomb bay to hold the power system to operate lasers or even megawatt jammers that will completely blind the enemy. The weird thing is that if lasers become a reality and power generation the key then the large size of the traditional bomber might see it flex into a more decisive anti-air role. Instead of simply launching missiles at long range it could enter enemy airspace, destroying enemy ground launched anti-air missiles and knocking down their fighters for as long as they have power generation. Things are evolving and the pace will probably pick up soon.